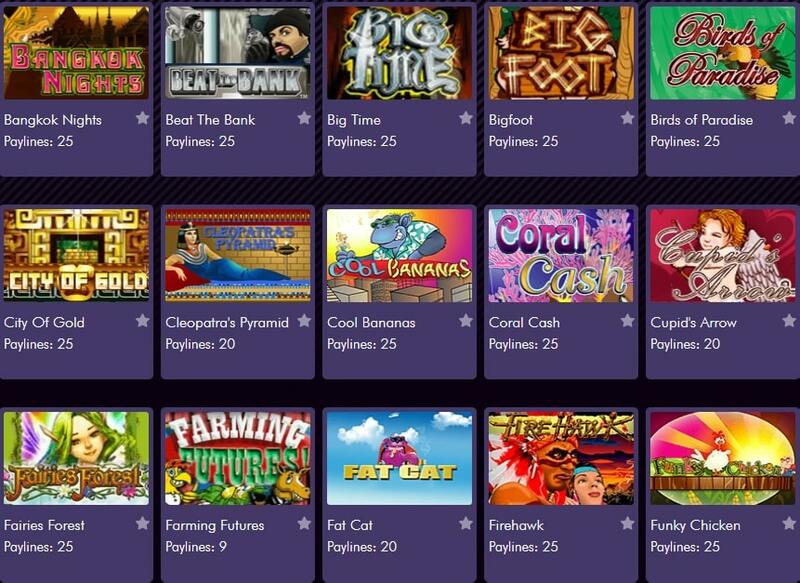 $5,000 in cash prizes in our Miami Month Long slots tournament. Play Cash Cow slots with $100 for only $5.00. End up top and you will win $1,500 cash instantly! Miami Club Casino was established in 2013 and it is operated by Deckmedia N.V., which owns numerous online casino properties and boasts vast experience in the gaming business. The casino is powered by WGS Technology, which supplies a fantastic range of slots, table games, video poker and tournaments that you can try instantly online or on the Miami Club Casino mobile offering, or by downloading the desktop application. 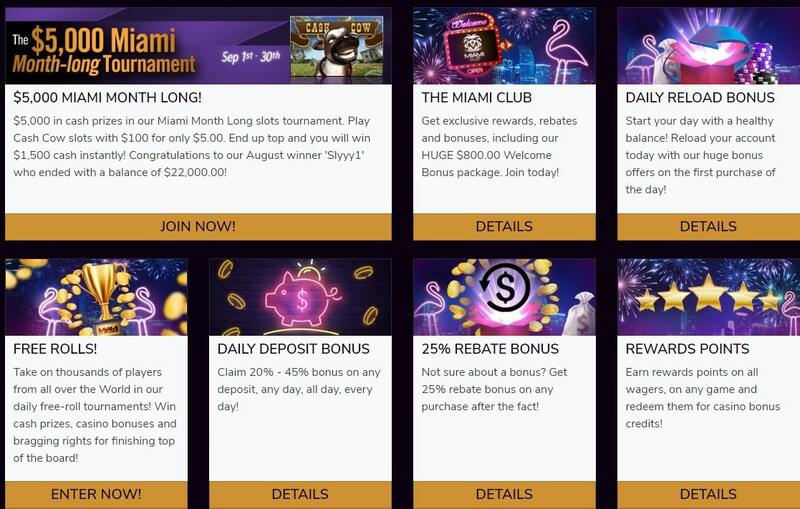 Miami Club Casino offers new players a welcome bonus of up to $800. This is offered over a player’s first eight deposits, matching 100% on up to $100 per deposit. These bonuses are subject to minimum wagering requirements which vary and can be found at the cashier when making a deposit. There are no ordinary promotions on offer on the website that players would find on other sites like happy hours, weekly bonuses and free spins. Instead, these are all offered through the loyalty rewards scheme. There is also an additional affiliates program players can sign up to. As mentioned above, Miami Club is powered by WGS Technology software, which has been around for over a decade now under the guise of firstly Odds On Technology, then more recently Vegas Technology. 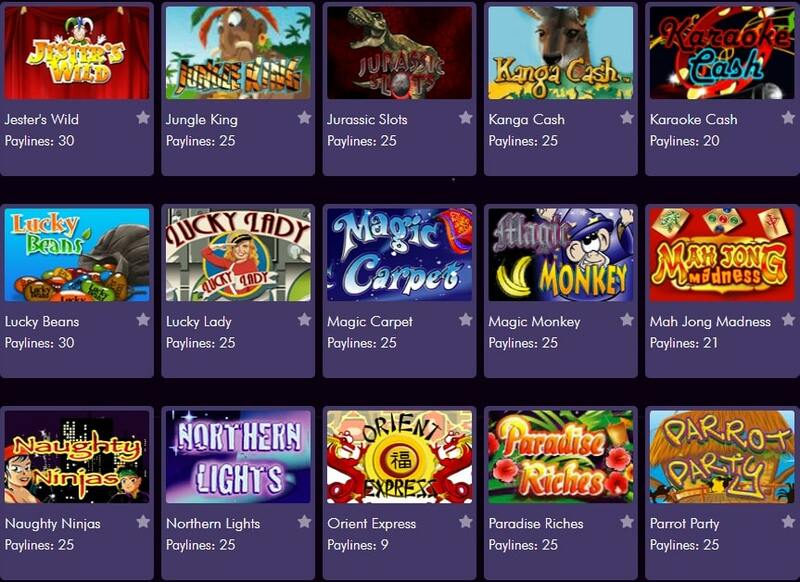 While the company name keeps changing, the games do not and you can find all your favourite games that you would have enjoyed if you are a player who visited one of the several casinos that have offered these games in the past. Title wise, Miami Club offers more than 150 different games, ranging from slots to table games, to specialty games such as Dazzling Dice. All of the games are animated nicely, although none seem to have that ultra high end look and feel that one might expect with a more modern IGT or Net Entertainment powered library. This does however have its benefits and I was impressed with the ease of which I was able to download and install the casino. With the “lightweight” nature of the games on offer, I was up and running within just a few minutes after hitting the download button. I also tried the no-download instant casino, and found the account registration to be just as simple. I enjoyed games like MahJong Madness and Casino Hold’em and the rest of the casino’s great selection of table games. Mulligan poker is a unique twist on the legendary card game that I found quite unique and enjoyable, and the blackjack interface enables experienced players to play at great speed. The slot machines are not the best lookers that you will find, nor are their any big name licensed tie-ins, but they all load and play quickly. Several contribute to pooled progressive jackpots that sit in six-figure territory at the time of this review. We’re happy with the level of support Miami Club Casino provides. Players can get in touch with a representative 24/7 through a number of different methods. Most inquiries are handled the fastest through live chat. This feature allows players to connect with a support representative instantly over the web. It is available through the website and the downloadable casino lobby. Players can also send an email to support if they prefer, although it does take longer than live chat. Seeing as how it supports American punters, I was not surprised to find the banking options at Miami Club to be a tad limited. The sad fact is that with the financial restrictions placed on internet gambling by the U.S. Government, there are few reliable options to deposit and withdraw funds from e-casinos. Unfortunately this is the case here, and American players who make a withdrawal will need to be satisfied with a choice between a Wire Transfer and a Check. Players from other countries can make use of e-wallets such as Neteller, Moneybookers, and EcoCard. 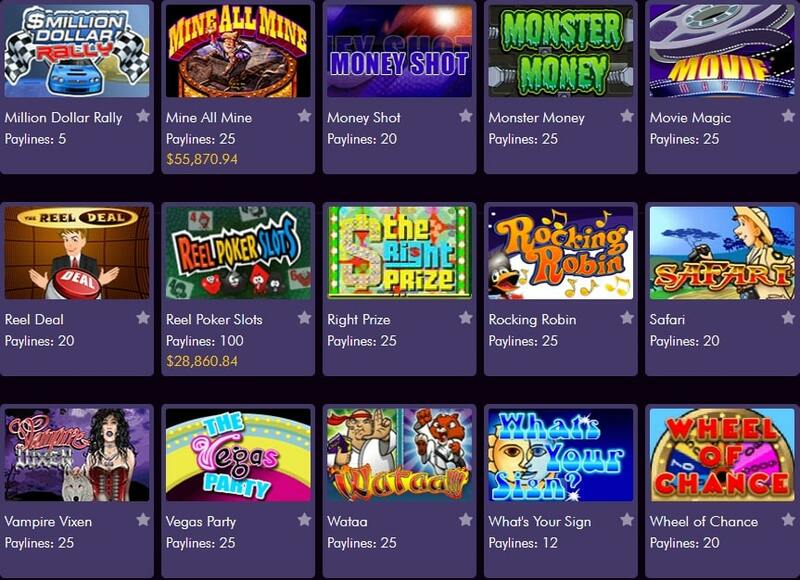 There is a withdrawal limit for players wishing to pull funds out of the casino, which is only $2000 per week. 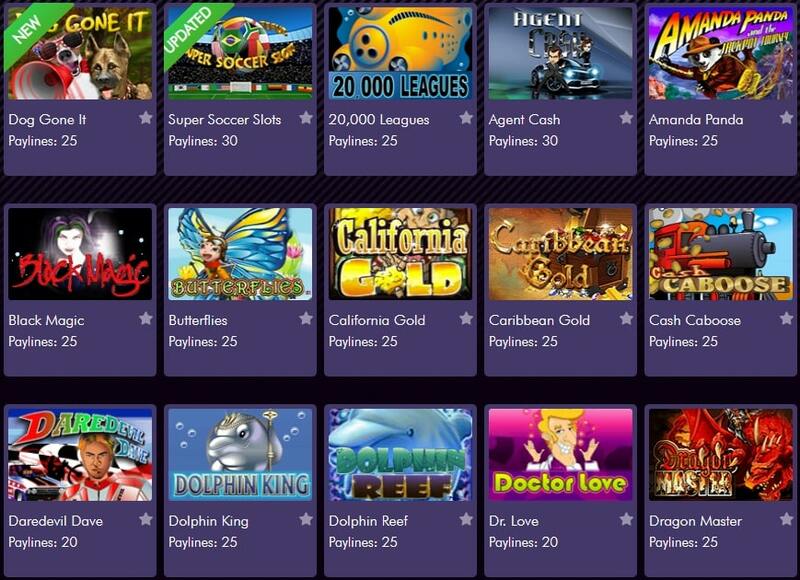 Miami Club Casino is a decent option for fans of WGS Technology games. The games are fun, they load quickly, and the tournaments system is a particular highlight. On the other hand, the casino is let down a little by small weekly withdrawal limits, and a complete lack of transparency about its operation. If you’re an American player this one is worth a look, but players from Europe and other regions have far better options to pick from.